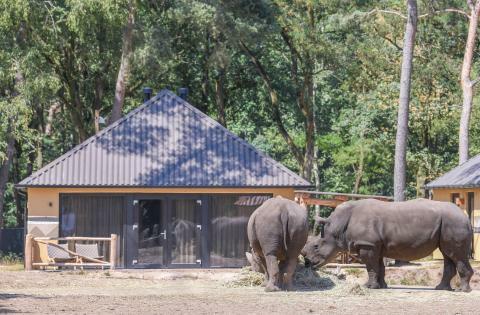 Safari Resort Beekse Bergen in Hilvarenbeek - the best offers! Safari Resort Beekse Bergen is located in the unique Brabant area in the south province of Netherlands. From safari to water fun activities, Beekse Bergen guarantees a day full of fun! This price applies to 6-person holiday house Savanne Lodge, with the arrival as 13 May 2019, 2 Nights. This price applies to 8-person holiday house Savanne Lodge Plus, with the arrival as 13 May 2019, 2 Nights. 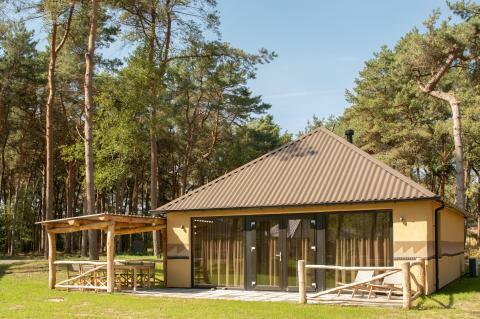 This price applies to 8-person holiday house Lodge Plus, with the arrival as 6 May 2019, 2 Nights. 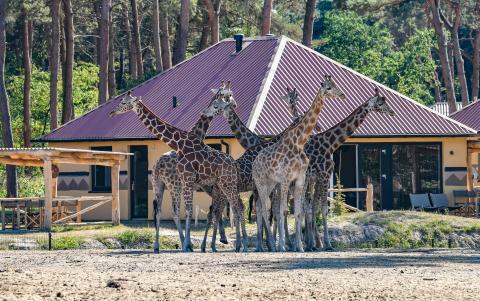 Safari Resort Beekse Bergen is nearby to one of the largest wildlife safaris in The Netherlands. When you stay at the resort, entrances are free for many activities, including the safaris! Enjoy the splashes at Beekse Bergen! Gallivant your way to the pools with views over the big lake. The indoor pool has various play and relaxation options that guarantee hours of swimming fun and refreshment. Moreover, the park offers recreation programs fitted for both children and adults. There are bicycle rentals, mini golf, table tennis and a playground. Beekse Bergen park houses The Cape Town restaurant offering delicious pancakes! For a quick bite, you can also go to Cafeteria Peuselhappie. There is even a supermarket if you’re feeling a bit peckish after your fun-filled day. With your booking, you will receive an Attraction Pass per person. With this Pass, you can have unlimited free entrance to the following theme parks in different parts of The Netherlands: Safaripark Beekse Bergen, Speelland Beekse Bergen, Animal Kingdom in Mierlo, Aviodrome Lelystad Airport, Aqua Zoo Friesland and Zoo Parc Overloon. NB. Access to the 6 theme parks is only valid if the relevant day attraction is open. Beekse Bergen is situated in Hilvarenbeek, a town south of The Netherlands (119 km from Amsterdam). If you are intrigued with museums, there are several around the area such as the Textile Museum (9.6 km from Beekse Bergen). You can also visit The Koningshoeven Brewery (6.9 km) to enjoy some authentic Dutch beer. A more of a bloody good reason to visit! If you want to have dinner at the restaurant of the holiday park during Christmas or on New Year’s Eve, we kindly advise you to make a reservation.